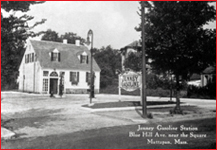 Auto Service & Tire beginnings date back to 1956 when Bill McKeen took over the Jenney Gas Station in Mattapan Square. The station was a small 2 bay shop where he worked on cars and pumped gas for 16 hours a day, seven days a week. Times were hard in the beginning, but little by little, each and every customer came to know and like Bill for his honesty and care he gave to them and their automobiles. The company is built upon the principles Bill McKeen exemplified his entire life; hard work, honesty and respect to every customer and employee. His six sons have taken those same principles to continue to make Auto Service & Tire the preferred repair facility in the greater Boston area. We are proud to see second and third generations of customers come in to have their automobiles repaired with us. Auto Service & Tire offers a one-stop shop for all of your vehicles needs: general repairs, scheduled maintenance, collision repairs, state inspection and towing. We provide personal service from a dedicated, family oriented staff. We understand the importance of your vehicle and will take every step possible to ensure that you are serviced properly and on time. Mattapan, Dorchester, Milton, Lower Mills, Hyde Park, Readville, JamaicaPlain, West Roxbury and Roxbury.